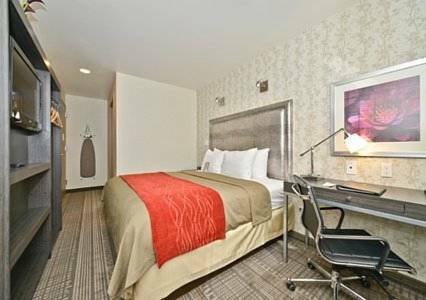 The Comfort Inn Midtown West hotel in New York, NY will get you refreshed and ready to take on the day for leisure or business. Our smoke-free hotel is conveniently situated in Hell's Kitchen near Times Square. Top New York City attractions are nearby including the Broadway theatre district, Empire State Building, New York City Civic Center and Madison Square Garden. Our valued guests enjoy amenities that include free hot breakfast, free WiFi, free coffee and a business center. Each comfortable guest room features a Flat-Screen TV, coffee maker, desk, hair dryer, iron and ironing board. Also, earn rewards including free nights and gift cards with our Choice Privileges Rewards program.